June 25th - August 14th 2011. Curated by Malin Barth, Director Stiftelsen 3,14. 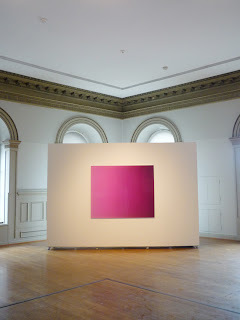 Gallery view 1 of the video trilogy installation Colour Kinesthesia and Colour Synesthesia Variation I and II, 2010-2011. Music by J G Thirlwell. Technical support Benny Mouthon and Manuel Sander. 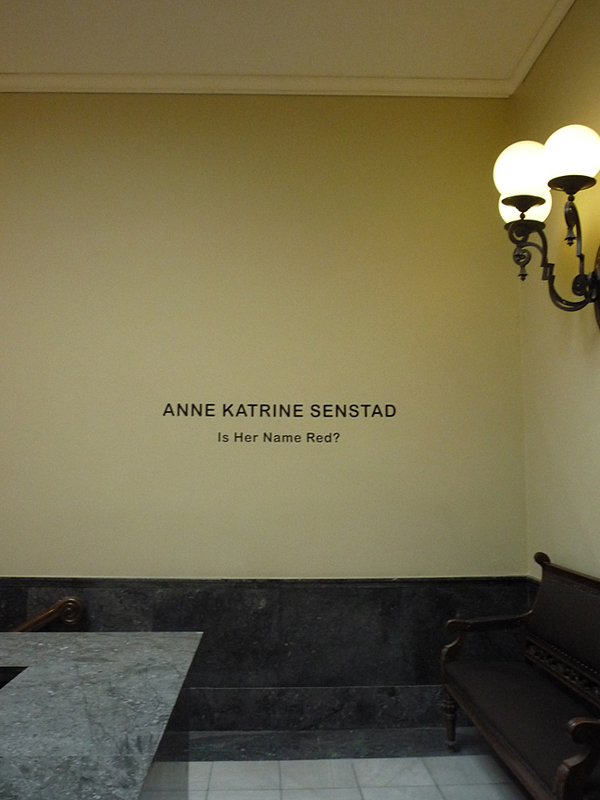 It is very exiting to present the world of artist Anne Katrine Senstad. 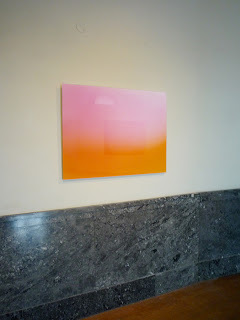 Her exhibition provides an extensively glimpse into her visual universe and all it has to offer. 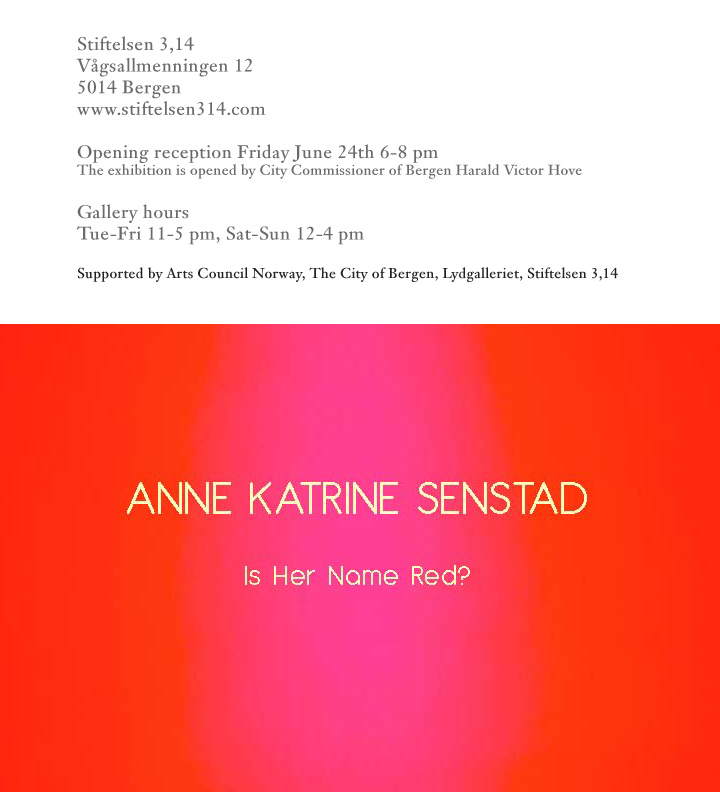 She represent the very new generation of self exiled Norwegian artists who is settled in New York - for this group of artists it has become true nature to work internationally. 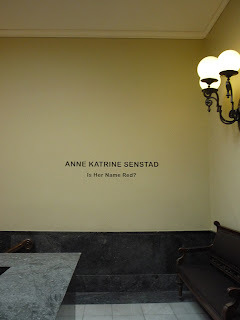 Only within the last couple of years alone she has exhibited in numerous institutions and galleries across 3 continents. 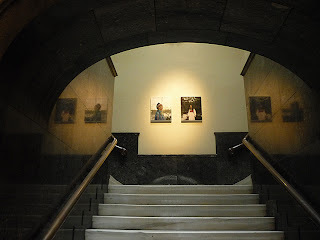 She still keeps Norway close at heart in her artistic exploration and as a starting point from where to draw inspiration for investigation of contemporary notions of identity. The motives are endorsed with expectations and contradictions, as well as contrasts and transitions. The work introduces ambiguity on one hand, and intrigue on the other. Senstad holds a unique ability to work across artistic styles and media. She moves freely between photography, video, and installation. For her solo exhibition at 3,14 we present three distinct strains of work that share a concern with the photographic portrait as well as abstract light and color recordings. 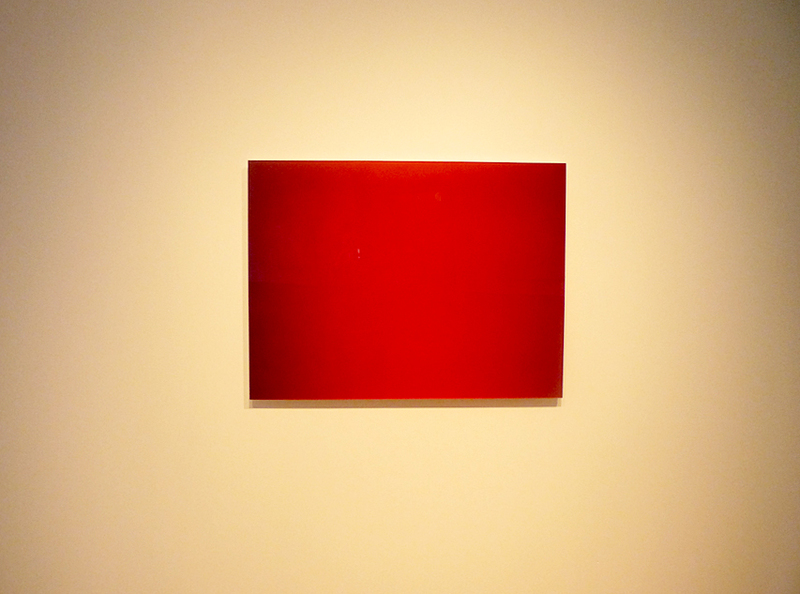 Each work provides viewers with clues about an expansive scenario, but reveals nothing conclusively. The combination and placing of works making us study the impact of both the figurative as well as the abstract language. 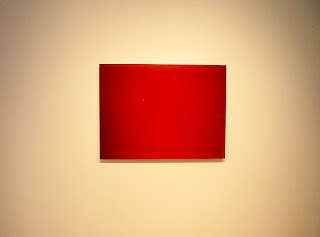 She has explored minimalist aesthetic and the possibility of abstract minimalism in photography alongside her other more resonant figurative images which richly drawn from the history of photography. 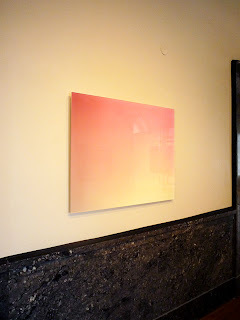 Cross genre collaboration introducing sound as an important aspect also become significant in her recent work. What creates the link between Senstad´s diverse works in this exhibition might not be apparent. By giving it some time to contemplate the work one might want to unite characteristic elements that add up and summarize markers of individual and cultural identity. Portraiture is recognized and established as revelatory of identity. A portrait can set forth to articulate an experience of our existence in time and space. What determines us as individuals, at a profound level, is the visible. It is the gaze that is from outside ourselves, and it is through the gaze we enter light and it is from the gaze that we receive our realization. From within we experience light and color as both objective and subjective. Color and light is fundamental visual element and part of defining the human experience. It influences us physically, psychologically, and socially; aspects of determining identity. 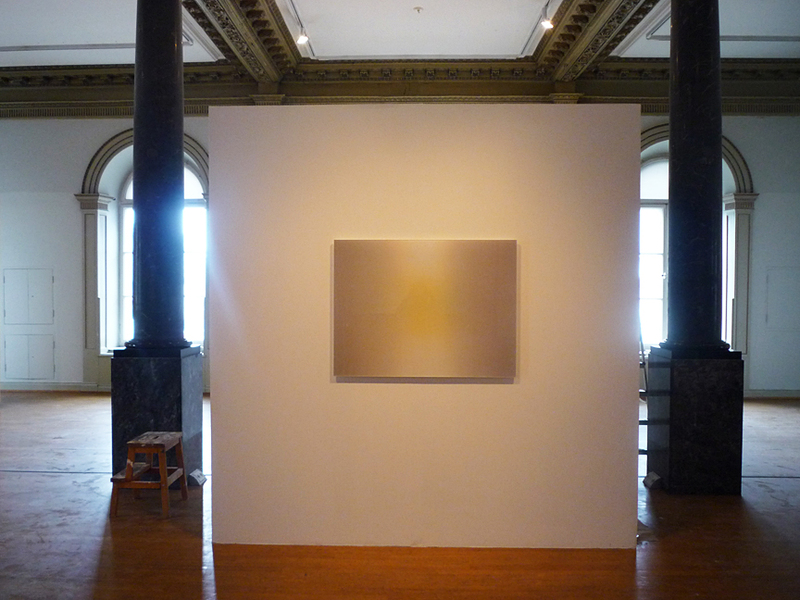 For the exhibition at 3,14 - consider Senstad`s work in a context of the force of globalization. Globalization frequently leads to disorientation for both national and individual identity. Norway has a longstanding tradition characterized by the quest in the historic period of 1814 to 1905 to locate and promote something purely Norwegian--something which Norwegians would like to identify with in order to legitimize an independent Norway. Skiing, combined with healthy sportsmanship and polar re-search became significant and pivotal then, and are still at the core of the identity in the present day as well. Senstad has included facets of this in her photographic portrait series. In The Norwegians, Volume Two, we are presented with Grete Waitz, the legendary marathon runner and advocate for woman athletes, Bente Erichsen, The Director of the Nobel Peace Center is featured in her training attire and hiking boots and the Musician Cecilie Hafstad Richards with her daughter in traditional cross country skiing jacket. Portrayed in a typical red anorak is also the explorer Liv Arnesen, who looks like she “is going on a hike”, a deep cultural obsession in Norway. Due to renewed interest and focus on media debates about immigration and national identity as a whole and “what is typically Norwegian” , here locally the codified national traits and activities are receiving increased analytical distance. Norwegians have in the last couple of decades been more frequently brought into contact with people whom they define as different through their own travels, influx in tourism, and entry of immigrants, and are thus brought to reflect on their own identity. They must be able to reflect why they describe themselves as Norwegians. Furthermore, the “shrinking” of the world imposed by globalization seems to lay pressure on their identity as something distinctive. The old and rather familiar is successively being replaced by the new and somewhat alien. It seems to threaten one´s uniqueness. On the other hand, the force from cultural complexity and globalization can play a major part of a modern identity crisis, that simultaneously should be understood as resolutions to dissolution of rigid borders. In Senstad´s abstract minimalist video and photography projects of color and light, she works with one of the most fundamental and essential elements in art. There are several universal meanings and collective unconscious reactions to colors, as well as biological reactions; for example to ensure survival like recognizing the color of ripe food. Today´s multicultural society shares global color significance on a number of things such traffic lighting where red means “stop” and green means “go” etc., but individuals from various cultures assign diverse meanings to color still, despite rapid globalization. Colors obtain symbolism through cultural references in the culture one grew up in, shaping human thought, emotions, and conduct. By looking closer at the color yellow one discovers it signify qualities such as hazards and coward in the West; reliability and strength in Saudi Arabia; royalty in China, while courage and love in Japan; commerce in India; mourning in Mexico and Egypt. Gender, age, class also play a major role in how people react to color on a visceral level, and with which color they associate themselves with. Pink is thought to have a calming effect in Western culture and should be “the” symbolic color of Norwegians, who like to identify themselves with “peace and quiet”. But her name is red. 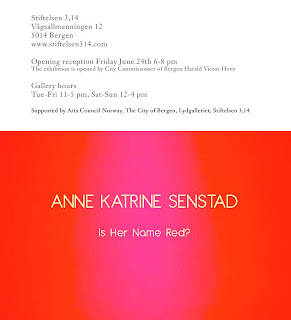 I wish to express my gratitude and special thanks to the artist, Anne Katrine Senstad, for her enthusiasm in exhibiting with us at 3,14. Thanks to all the effort she has put into making this exhibition a success and supporting the curatorial take on her work. The works in this exhibition represent an in-depth view of her artistic production and the artist´s development in recent years. This exhibition can be seen in relation to a string of recent shows at 3,14 with focus the individual person in our globalized world.